While it's generally accepted that the tonearm is not as important in influencing sound quality as the main bearing, power supply or motor, its role is still vital in ensuring the stylus is able to track a record. In a perfect world, the arm should be free to move in both lateral and vertical planes without friction. It should not oscillate or resonate following a stylus movement. The Ekos SE features advanced materials carefully selected for their sound performance and low resonance properties to minimise interference, resonance and microphony, allowing you to extract stunning musical performances from your vinyl collection. The Ekos SE has a machined titanium arm tube to reduce resonance within the arm, a stainless steel bearing housing, where the wall thickness has seen a nearly threefold increase over that used in the original Ekos, which helps reduce unwanted tonearm movements. Ultra-low friction bearings and temperature compensated precision springs ensure that the exceptional performance of the Ekos SE is maintained regardless of whether you are listening to your first track of the day, or after many hours of music. Recently, a number of improvements, including a new heavier counterweight and revisions to the headshell to allow for easier fitting and the use of non-Linn cartridges, have been introduced. The anti-skate platform has also been revised and now has a paint-free finish. Every Ekos SE tonearm is built to last using the latest manufacturing techniques and handcrafted to the highest quality standard, so that you get the very best musical reproduction from your vinyl collection. The Ekos SE is the reference against which other tonearms should be judged. The Akito, now in its latest 2B guise, incorporates technologies developed for Linn’s class-leading high-performance tonearms. Features include precision bearings, accurate static tracking and precision-spring bias adjustment. The strong die-cast headshell is bonded to the main arm tube using advanced adhesives and together they provide a stable platform for supporting a wide range of cartridges to ensure you get the most from your vinyl collection. The Tiger Paw Javelin may have similarities to the long discontinued and sadly missed Naim Aro tonearm. In real terms though, this was only used as an inspiration and Javelin has been developed with new materials and assembly processes to produce an outstanding arm capable of resolving more information, more accurately, to create a uniquely musical arm capable of extracting the most from modern high-performance cartridges. The arm is released with Linn compatible mounting for standard Linn armboards, Linn Kore and Tiger Paw’s own Akula. Tiger Paw will shortly be introducing a version, which will be compatible with Linn Keel for Aro and then after that, a version to fit the standard Linn Keel. For an in-depth article about the inspiration and development of the Javelin, please click here. The latest Roksan Nima tonearm combines solid aluminium alloy tubing (which is now fully grounded), a stainless steel alloy and a polished acrylic uni-pivot cup assembly. This remarkable arm is made of no less than ten individual precision-machined components. The unique design of the O-ring transit locking mechanism of the uni-pivot bearing assembly not only provides a safe transportation method, but also avoids damage if the arm is accidentally lifted off its bearing. In order to transport the arm, all you need do is gently lift the bearing cup a little and the assembly is held by the O-ring. Anti-skate is adjusted easily by the position of a thread and weight. Azimuth correction (necessary with uni-pivot arms) is provided by an O-ring decoupled, mirror-chromed counterweight, which has its mounting hole offset. This not only allows for azimuth correction, but cleverly lowers its centre of gravity, a very simple and cost effective solution, and this pretty much sums up what the Nima design represents overall: a tonearm capable of delivering wonderful music, at a fraction of the cost of many of its competitors. 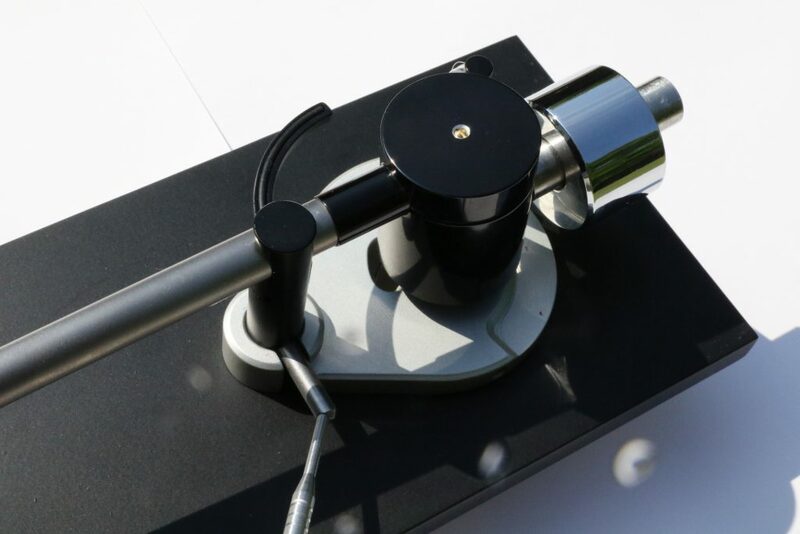 The Rega team has worked tirelessly to improve every aspect of this new tonearm. Offering improved ergonomics, usability and sonic performance. arm clip and an improved spring housing with easier to read numbers. Other improvements include a Rega made, low capacitance phono cable terminated with high quality ‘Neutrik’ plugs, improved lower friction, precision horizontal and vertical bearings and a re-designed 100g mild steel balance weight. The ultimate uni-pivot arm? Many of us believe so. Despite the Aro’s extreme simplicity, it was – and remains – so very capable in extracting so much music from the record’s grooves. A versatile tonearm, achieving great results with many different cartridges, even though originally it was designed with just one cartridge in mind, the Linn Troika. Despite its discontinuation, the Aro continues to have a loyal following and many products have been brought out in recent years to complement it. These include the Linn Aro Keel, Aro Rubikon, the Tiger Paw Elevator arm lift and a new adjustable counterweight from Tiger Paw called the sKale for Aro. Gone, but not forgotten, please contact Peter if you wish to buy or sell an Aro.